North Asia will gain three new 777-300ER operators in 2014, boosting the number of 777-300ER operators in North Asia to nine. Deliveries in 2014 to China Airlines, China Eastern and China Southern will, for the first time, see the majority of North Asia's long-haul operators use the 777-300ER, mainly to North America but also to Europe. While the aircraft may be used similarly, their genesis, configurations and implications are different. China Airlines will catch up to EVA Air and replace 747-400s with the 777-300ER, allowing for moderate growth. China Eastern will replace A340-600s with 777-300ERs and then conduct large long-haul growth, which it originally intended to do with now-cancelled 787s. China Southern will use its 777-300ERs to fill a capacity white spot in its fleet between A330/787 and the A380, evidenced by using the 777-300ER to open a new service to New York JFK. China Southern will introduce the lowest business configuration yet on the 777-300ER in North Asia with only 34 seats; the average prior to its configuration was 50. This is in contrast to China Eastern, whose 56 business class seats – the second-largest density – come with the tradeoff of fewer economy seats than at China Southern. Both carriers will have a small first class cabin of four seats while China Airlines will drop first class (offered on its 747-400s) but introduce premium economy (not present on existing 747s), bringing its configuration largely in line with competitor EVA – and attempt to surpass by licensing Air New Zealand's Skycouch. China Eastern will be the first North Asian carrier to have 10-abreast seating in economy on the 777-300ER. China Southern will be the first of the trio to receive a 777-300ER, taking its first from a 2012 order in Feb-2014, according to local reports. The Guangzhou-based carrier is due to receive four more of the type this year, with one delivery in Jul-2014, two in Aug-2014 and one in Dec-2014. China Southern already operates the 777-200 (as well as freighter version) whereas China Airlines and China Eastern are entirely new 777 passenger operators. China Airlines has 10 777-300ERs on order (including four to be leases) and is due to take delivery of three in 2014, the first in Sep-2014. China Eastern has 20 of the type on order and is due to receive its first in the second half of the year. It could receive up to four in 2014. The addition of China Airlines, China Eastern and China Southern will shift the proportion of North Asian long-haul carriers operating the 777-300ER to more than half. The only long-haul North Asian carriers without known 777-300ER orders are Asiana Airlines (using 777-200s and soon A380s, and later A350s), Hainan Airlines (instead using 787s), MIAT Mongolia (using 767-300s), Skymark (due to receive A380s at the end of 2014), Sichuan Airlines (using A330s) and Xiamen Airlines (due to receive 787s in 2014). Other widebody but regional Asian operators not using the 777-300ER are Dragonair (part of Cathay Pacific), Hong Kong Airlines, Shanghai Airlines (part of China Eastern) and TransAsia. North Asia's nine 777-300ER customers will use 11 configurations: ANA and Cathay Pacific each have two. This excludes JAL, which is transitioning to a single 777-300ER configuration. The average configuration is 285 seats: five first (2% of total), 49 business (18%), 26 premium economy (9%) and 205 economy (70%). Both of ANA's configurations are above the average in all premium cabins but below in economy. ANA's configuration with 112 economy seats is the lowest, followed by JAL (135) and then ANA's second economy configuration (166). Cathay's first configuration (with first class) is generally at the average mark for premium cabins (but lower in economy) while the second configuration is lower than the average for premium cabins (but higher in economy). China Airlines becomes the second carrier, after EVA Air, not to offer first class on all 777-300ERs. Only some of Cathay's 777-300ERs do not have first class. China Eastern joins Air China and Korean Air in not offering premium economy. China Airlines' cabin offering will be similar to EVA Air, although exact seat numbers have not yet been disclosed. China Airlines did announce it will have lie-flat beds in business class and is the first airline to licence the Skycouch economy seating product from its creator, Air New Zealand. China Southern's business class configuration of 34 seats is the lowest. The next lowest offering is from EVA Air (38 seats) and Cathay's high-density (low premium, high economy) configuration with 40 business seats. China Southern's business class will comprise only 11% of total seats on the aircraft, a notable difference from the 16% of seats in business class on its A380. China Eastern and China Southern will have similar total: 318 for China Eastern and 309 for China Southern. The difference is partially in weighting of premium and economy seats. But China Eastern will have 60 first/business class seats compared to China Southern's 38. China Eastern's 56 business class seats is the same as Korean Air, and second only to ANA's configuration with 68 business seats. China Eastern will have 258 economy seats compared to China Southern's 271 (including premium economy). China Eastern is achieving a higher premium density and higher overall configuration with 10-abreast seating in economy whereas China Southern will seat nine-abreast. Note: Due to rounding totals may not equal 100%. This table excludes configurations being phased out (such as one of JAL's). 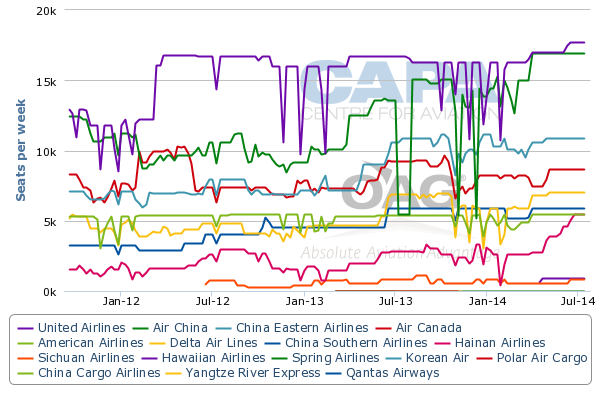 China Eastern is the first in North Asia to go for 10-abreast in economy – the domino falls? China Eastern becomes the first North Asian carrier with 10-abreast seating in economy on the 777-300ER, according to the carrier's regulatory filings. North Asia has so far resisted the tighter 10-abreast seating that has increasingly become standard in the Middle East, Europe and North America. 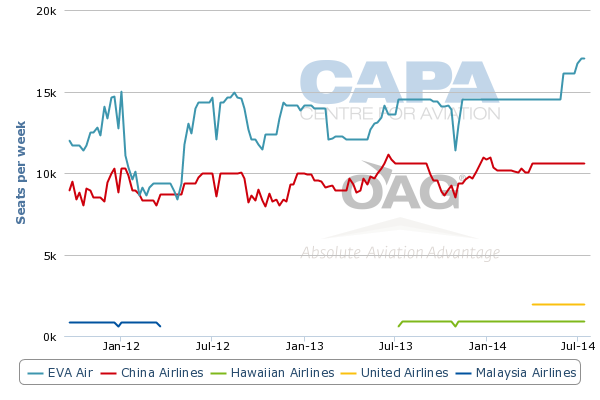 North Asian airlines have previously held strong views on remaining at nine abreast. But with one domino falling, competitive pressure increases – or makes it easier to follow suit than be the first to break rank. The 777X's wider cabin may make the denser configuration more likely. In Southeast Asia, only Philippines Airlines has 10-abreast in economy. Garuda, Singapore Airlines and Thai Airways have nine-abreast. In Australia and New Zealand, Virgin Australia seats nine-abreast in economy while Air New Zealand seats 10-abreast. China Airlines' acquisition of 10 777-300ERs (six on direct order, four via leases) will largely replace its passenger 747-400s, which number 13 in Jan-2014. The 777-300ERs bring efficiency ahead of A350s that will be delivered between 2016 and 2018. 777-300ER deliveries will end in 2016. EVA Air has already largely replaced 747-400s with 777-300ERs and then grown its long-haul fleet. EVA Air operates 15 777-300ERs with another seven on order, giving it a 777 fleet twice that expected of China Airlines. Government-owned China Airlines is finally dropping first class, having likely kept it for strategic, not profitable, reasons. Also on the 777-300ER the carrier will introduce premium economy, which the carrier had offered on only a handful of A330s. China Airlines joins the North Asian trend of offering a premium economy cabin while making it only the second carrier after Cathay to have a configuration that drops first class (Cathay retains one configuration with first class; EVA Air has not operated first class in recent times). China Airlines' old long-haul fleet has seen it unprofitable in the North American market and taken a smaller position whereas privately-owned EVA Air has seen financial success and is the largest operator from Taiwan, and ninth-largest overall between Asia and the US. It is not often the flag carrier does not enjoy dominance. A340-300s, which serve China Airlines' sole European points of Amsterdam and Vienna, do not bring efficiency, but total route performance is impacted by the European economic situation. China Airlines expects to introduce 10 777-300ERs and withdraw nine 747-400s, leaving four 747-400s that will be used mainly on regional Asian routes but also possibly to Europe. The 747-400s in Jan-2014 are mainly used to North America but also regional Asian routes as well as seasonal service to Brisbane, continuing to Auckland. A340-300s serve China Airlines' sole European points of Amsterdam and Vienna. So the replacement of 747s with 777s is focused on North America. China Airlines' North America (excluding Hawaii) passenger service in Jan-2014 comprises a daily service to each San Francisco and Vancouver, 13 weekly flights to Los Angeles and three weekly flights to New York JFK. All see 747-400 service, although Vancouver can see A340-300 service. China Airlines' North American schedule should not require the full use of 10 777-300ERs, so there are growth opportunities – but not nearly as much as the level China Eastern and China Southern will usher in with their 777-300ERs. China Eastern has lagged on long-haul growth and has dearly felt the pain from delays in 787 deliveries, having banked on the type for expansion. China Eastern is at times criticised for not having more long-haul flights, but like a number of carriers, delays in aircraft set it back significantly. For long-haul flights, China Eastern was dependent on five A340-600s, which proved uneconomical and which it did not want to expand. In more recent years China Eastern has been able to expand in certain markets (San Francisco, for example) with A330s. China Eastern's deal with Boeing for 20 777-300ERs includes the manufacturer taking China Eastern's five A340-600s. China Eastern expects the change from A340-600 to 777-300ER to immediately benefit its long-haul network, and ideally reverse its loss-making position in North America. Europe, due to the economic situation, will likely take longer. China Eastern's A340-600s are used for daily service to Los Angeles, New York JFK and Paris CDG (in peak season). China Eastern expects to introduce a second daily service to Los Angeles and New York JFK. Air China already has double daily service to Los Angeles (as do other Asian carriers) and has 12 weekly flights to New York JFK. China Eastern is due to receive four 777-300ERs in 2014, five in 2015, five in 2016, three in 2017 and the balance afterwards, according to regulatory filings. China Eastern will send one A340-600 to Boeing in 2014 and the remaining four largely in the first half of 2015, enabling a swift retirement and transition to a more efficient fleet. In some cases, operating improvements will be noticed overnight with the aircraft switch. China Eastern's order for 20 777-300ERs will, based on Jan-2014 figures, make it the fifth-largest 777-300ER operator behind Cathay, Korean Air, ANA and EVA Air. China Eastern will notably have more 777-300ERs than Air China, which took its first in 2011 and has 16 in service in Jan-2014, according to CAPA's Fleet Database. China Eastern has lagged long-haul growth compared to Air China and China Southern. This especially stands out given China Eastern's envious position in Shanghai, China's financial capital. China Eastern had been planning long-haul growth with the 787, having ordered 24 of them with delivery around 2008. After a number of production delays, China Eastern found the 787 would no longer be able to perform flights the carrier had originally intended for the aircraft. As a result, China Eastern cancelled its 787 order and later ordered the 777s. This unfortunately cost it time – upwards of six years – and market share, but China's growth is still young. China Eastern will have an opportunity to catch up, but must also prove it can capitalise on its Shanghai position. China Southern's need for 777-300ERs is far less pressing than China Eastern's, although China Eastern is an extreme case. China Southern has a gap in its fleet between 210-seat A330-200s (used to Europe and Australia), 228-seat 787-8s (10 in service/on order) and 506-seat A380s (five in service with none on order). China Southern also has 284-seat 777-200s, but these are falling out of favour due to their older product. China Southern had the need in its fleet for a long-range aircraft with sizeable capacity in both passenger and cargo compartments. For many prospective long-haul routes, A330-200s and 787-8s were too thin while the A380 was too big. China Southern's planned Guangzhou-New York JFK route (launching four weekly in Aug-2014) is a prime example: the route would have needed more range and capacity than what the 787 could offer but an A380 would have been over-kill. Just as China Airlines has a sub-optimal fleet and a smaller trans-Pacific position compared to EVA Air, China Southern is the smallest of China's major carriers in North America. Its sole points have been Los Angeles and Vancouver. Even privately-owned Hainan Airlines serves more North American destinations than China Southern, but with smaller-capacity aircraft (China Southern flies the A380 to Los Angeles – the sole long-haul flight for its A380). Many airlines in North Asia have had the 777-300ER as a competitive advantage, but by the end of 2014 it will be more common than unique. It will take a few years for the new operators to gain a sizeable fleet – which they potentially may do with a more advanced product than they offer on their current older aircraft – but carriers will still have to aim for differentiation that results in yield advantages, or will have to become more efficient to cut costs. Fortunately there are revenue opportunities on the upside, as well as excess weight to trim from cost bases. Once those objectives begin to be realised, it will not be too long before next-generation aircraft like the 777X – of which Cathay is the current sole Asian customer – usher in a step-change in efficiency and provide another opportunity for product improvement. And so the race continues, but now at a quickening pace.